Glycosylation is one of the most important post-translational modifications to consider during your characterization assessments. BioPharmaSpec scientists will use their product knowledge and technical expertise to suggest the best carbohydrate assessment for your biopharmaceuticals. The glycosylation pattern can be significantly affected by even simple changes in the manufacturing processes, such as a pH change or a change of growth media, and these carbohydrate alterations can impact the functionality of your biopharmaceutical. Comparability of the glycan profiles across various batches will prove that your manufacturing process is under control and for this reason, the regulatory authorities will request monosaccharide composition analysis data (e.g. levels of mannosylation, galactosylation and sialic acid) and N-linked oligosaccharide profiling data from various batches. 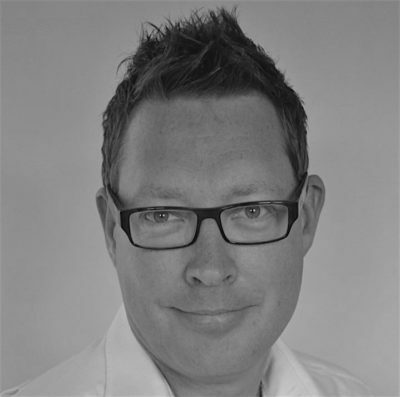 Obtaining data on monosaccharide composition is the first step in understanding the glycosylation patterns of your biopharmaceutical. BioPharmaSpec uses Gas Chromatography with Mass Spectrometric detection (GC-MS) to allow identification and quantitation of the levels of the neutral sugars (Fucose, Mannose and Galactose), amino sugars (N-Acetylglucosamine, N-Acetylgalactosamine) and Liquid Chromatography with Fluorescence for the detection of sialic acids (N-Acetylneuraminic acid and N-Glycolylneuraminic acid) following DMB labeling. Following monosaccharide composition analysis, the next stage of analysis moves into characterization of the oligosaccharides present on your product. 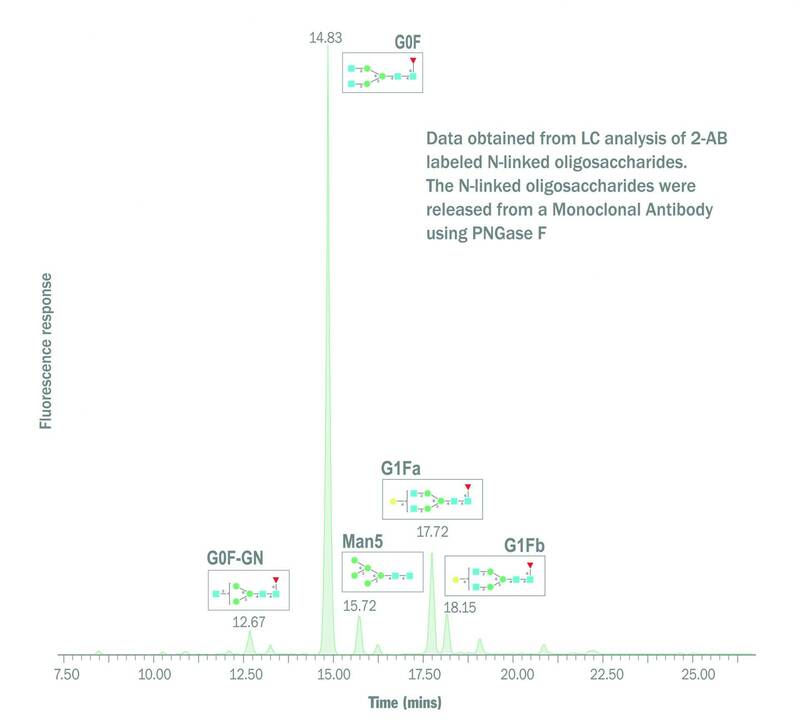 An example of the methodology used for releasing, purifying and analyzing the N-linked glycans from a monoclonal antibody is shown below. 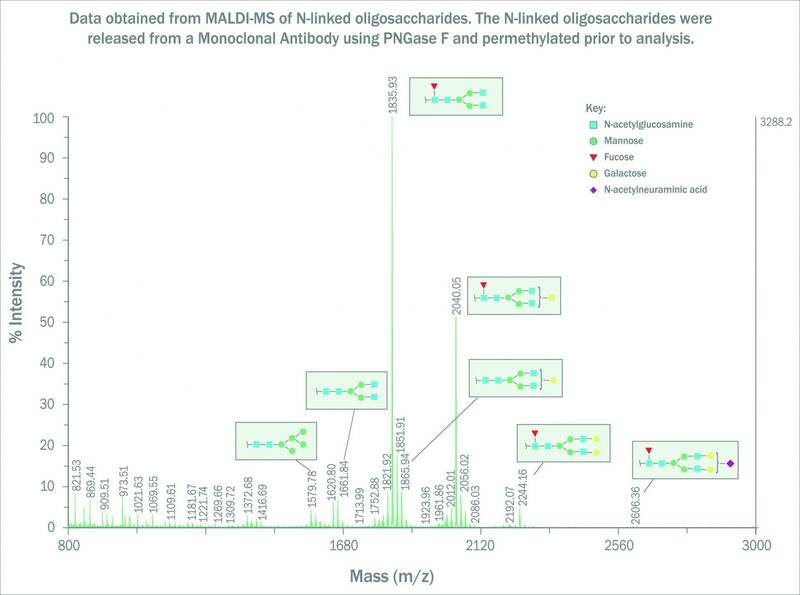 The N-linked glycan fraction can then be analyzed using mass spectrometry and/or liquid chromatography based techniques or on line LC-MS. An example of the data obtained from liquid chromatographic analysis of 2-AB labeled N-linked oligosaccharides is shown below. Released N-glycans can also be analyzed by MALDI-MS, usually following permethylation. An example of the data obtained from analysis of the N-glycans released from a Monoclonal Antibody is shown below. MS/MS data can also be obtained of individual glycans for antennal fragments. These data sets can be used to provide a relative quantitation of the N-linked oligosaccharides observed and suggest the structures of the N-linked glycans present.